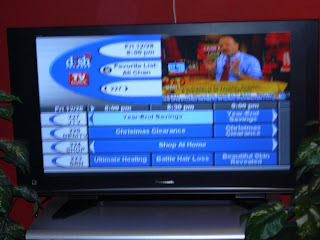 Just a blog to share my experience in buying a HDTV. if my father stayed with us, it was that one international channel. None of these technically require a big screen, and yet, I chose to blow some cash in getting one double the size. My hope was some day I'll get a chance to watch movies and some HD stuff to my liking. We bought a "Panasonic 42" 720p plasma". The following explains the choice behind each one of those words in quotes. Technology: There are 4 main technologies to pick from: CRT, DLP, LCD and plasma. CRT offers the best quality, yet, people don't want to buy them anymore. The reason is they are heavy, and hence haven't gone beyond 36" - two or three big guys drop it in your home and that's it, you can't even move it an inch. This was also a reason why I settled for the 20" CRT when I bought a TV the previous time. DLP is popular as a big screen (65") option for a theater-like experience to watch movies. They still have a bulky back, though not as bad as CRT. Apparently there is an expensive bulb it uses to operate, and you may have to replace the bulb if it blows out. LCD on the other hand is pretty light. A 40" LCD TV would weigh around the same as a 20" CRT (around 60-70 lbs, the last I checked). LCD screens have bright displays, and provide a good viewing experiece in the less than 50" range. However, they have been dinged for not producing deeper blacks (which results in better color). The new models have gotten better, so this issue is more a marketing mudslinging at this point. The other issue with LCD is the viewing angle - if you watch the screen from the sides, it might appear dull or have lost color. This also is not so much of an issue with wider angle viewing in newer models. Plasma panels produce deeper black, and the colors show better than LCD. They come in 40" or more, and popular in the big-screen category. They are heavier than LCD but much lighter than CRT. There is a phosphor burn-in issue with Plasma panel, which permanently leaves a mark if you leave an image for too long (like leaving it on pause for 6 hours or more. Or, watching a channel for several hours with a logo that appears all the time. Or using it for playing video games, where parts of the scene don't change color for hours). While this sounds worrisome, it turns out the CRT TVs we are used to had the same issue - if we didn't worry about it then, we don't have to worry about it now. Many newer models have anti-burn feature, if it still bothers you. I was open to both plasma and LCD, but the final combination of size,weight, price, quality and brand pulled me towards plasma. Yes, size does matter for an idiot box! First, it determines weight - I personally like things that I can lift and move by myself or with little help from others (don't want to be liable for someone else's back). Next, and more important for people, it determines the viewing experience relative to the room size. Generally, apartment dwellers may prefer 42" or smaller, to be prepared for moving or fit in the smaller living rooms. Home owners who have the bigger square feet pick more than 42". I first started with 50" target, since we thought our room could use that size, and worked my way down to settle with 42". The 50" pretty much meant plasma, and the weight was over 100 lbs.That was still ok, but when I compared with 46" LCD, the latter was around 70lbs. The price was also competitive, as plasma TVs are generally lower priced than LCD counterparts. Then, a visit to a relative's place changed my mind to consider 42" as well. They had a 42" and it looked pretty big for the room. We have to keep in mind how it looks in the store versus how it will look in our home. Brand matters for customer support, warranty, and prestige. I missed a $1000 Vizio 50" plasma deal at Costco on thanksgiving sale, but even without the deal I was ok with paying $1200. However, I wasn't sure about customer support, and the design was not fully black (the bottom portion was silver), which was a turn-off for us. Sony and Samsung stand out among LCDs, and I was seriously considering the 46" versions of both. Sony has S2500, S3000, V3000, W3000 in ascending order of price and features. I was limited to S2500 or 3000 which were more in the $1600-$2000 price range. The display and audio features also differ, but bright colors and surround sound effect was good enough for me - I am not the type that uses ampliers or 5-speakers to hear it loud. Samsung 46" LCD was not only cheaper in the $1400-$1800 range, the models also had enhanced features. Apparently they are also best sellers in the US. While I was trying to decide between the two at Fry's Electronics, I also noticed a Panasonic plasma 42" for sale for $900. Panasonic was supposedly the leading brand for Plasma. I wanted to check out the same at Costco, if they offered a better price. It turned out, Costco had a Panasonic listed for $1000, but it was a different and better quality model - I could tell by looking at the picture. Moreover, Costco also had a better warranty period for 2 years as opposed to 1 year. So, I settled for Panasonic, as it saved around $500 vs. the LCDs, I could get equal or better viewing experiece with deeper black, and the weight was comparable at ~70 lbs. I also noticed a Toshiba LCD at Frys, which had rich colors for a $800 price tag, but the audio quality was not satisfactory - the Toshiba models which had better audio were priced over $1100. Lastly, the pixel resolution. we picked 720p beacuse at 5 feet or more from the TV, apparently, it doesn't make any difference with 1080p. Yes, it is 2 Million more pixels with 1080p, but why bother to pay more if it doesn't make a difference? Finally, we sold the older 20" CRT for $40 - I couldn't beleive it was sold overnight after posting on Craig's list. Before I even checked emails in the morning, some one called me and picked it up right away. So, net net, the new TV was $960 + tax. We are very happy with our new Panasonic. It still runs cartoons and food channel, but I think the viewing experience is much better. Atleast, I think the bigger idiot box didn't make look like a bigger idiot!